Our sheep were sheared a few weeks ago, and I wanted to document the wool processing before we get to spinning for everyone. First we skirt the fleece. Our barn cat Ash wanted to assist with this, but mostly he was a distraction. I think he thought the fleece was a new gift to him. To skirt your fleece lay it out on a clean sheet or table. I put it on my trusty picnic table - the heart of my outdoor life in the warm months. Go through the fleece picking out bits of hay and pulling off any matted, manky, or felted pieces. Generally the fleece around the legs, belly, and tail is too dirty or matted for use, although my shearer pulls that stuff off anyway so I had less skirting to do than some folks. Skirting can be a challenge for a new spinner because you want to save every scrap of fleece, but trust me your spinning will be more enjoyable if you get rid of that junk right now. Pull out any second cuts you find at this stage as well. Now that you've got your fleece skirted, sort it into staple lengths. You want shorter locks together and longer locks together. I do this by putting different lengths in lingerie bags as I go along. I process my wool in tiny batches - because I just don't have a lot of space or chunks of time to dedicate to this - so I scour and dry the wool one lingerie bag at a time. (Yep. It'll take weeks to get through just two fleeces this way. The joy is in the journey hahahaha. Ok, mostly the joy is in not having wool in every corner of my house from trying to do this all at once.) So I fill the kitchen sink with hot water - as hot as you can stand - and a generous amount of Dawn dish soap. Once the sink is full of soapy water press your lingerie bag into the water. 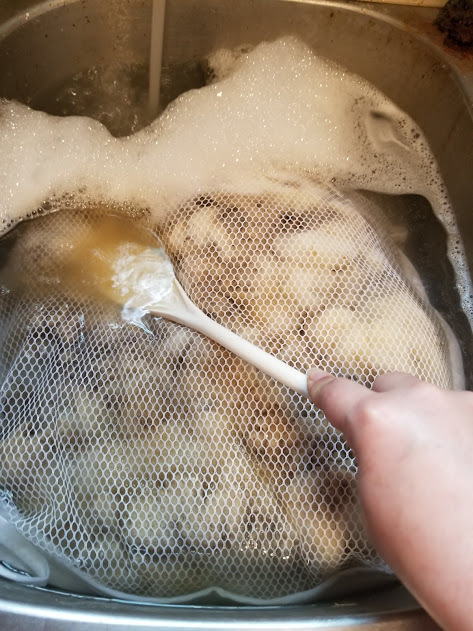 You'll immediately see the water begin to cloud with the dirt and oil from the wool. Drain the dirty water and repeat the process until the water is clear, adding more soap each time and being sure to always use very hot water. I do alternate with my soap - I do the first two or three scourings with Dawn and then finish up with a cheap shampoo. I find that I get everything cleaner that way. This is the only time I buy shampoo so I get something with a smell I like and try not spend much on it, or ask my family members for unwanted shampoo. (This is not even slightly the weirdest thing I ask them for. They are used to it.) If you know anyone that works in the hotel industry maybe they would save you the unwanted shampoo samples, even. There are also products made for washing fleece, and you can purchase those, but c'mon spend money? Pah. When you're filling the sink, try to keep the water from agitating your fleece and always be sure to use very hot water. Cold water or too much agitation will cause your fleece to felt. Now one little tip I will pass along is that when you're new - try to push the limits. Get a few handfuls of fleece and actively try to felt it to find out the tolerance of that particular wool. Wool, like eggs and milk, is an animal product that will have individual variations according to the animal it came from. Some is more inclined to felting than others. Don't be afraid to experiment with a little bit and see how far you can push it. Keep soaping and pressing and rinsing until you get clear water. Drain the fleece in the sink for a bit (some folks hang it up in the shower or tub to drain) and then spread it out in a thin layer to dry. It takes some time to dry out - so give it a day or two and check it often for wet spots that might need to be turned or spread further. Once dry, you're ready for combing/carding, and on your way to spinning.